We are excited to announce the release of SoundCheck 17 this week! 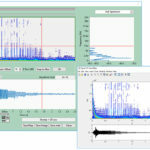 This new release offers many features to simplify multi-channel and voice controlled testing, such as a new level and cross-correlation trigger, average curve/waveform post-processing functionality, the ability to easily read and work with multichannel wavefiles, multiple DC Connect control, and enhanced database options (useful when processing data from a large number of channels). On the usability side, SoundCheck 17 offers increased flexibility in colour pallets, save to MATLAB option, and the ability to recall CSV formatted text files.